Franklin Medical Center is a medical treatment prison located in Columbus Ohio. It treats over 615 minimum, medium, close custody and Death Row inmates. Offenders at this facility require more medical attention than can be delivered by the medical staff at the prison. Two of the units at Franklin Medical Center offer short term care, while a third unit provides care for inmates with long term medical needs or patients who have severe physical disabilities. Additional inmates housed here have a terminal illness and require palliative care. 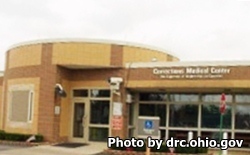 Although Franklin Medical Center is health care facility it still offers a significant number of programs to inmates. These include services like Alcoholics and Narcotics Anonymous, victim awareness, re-entry and release programing, and family life skills. Inmates can earn a GED and take adult basic education courses while at Franklin Medical Center. Additionally, offenders can take vocational courses in culinary, tailoring, animal training, health care sanitary technician, electrical systems, HVAC, nursing assistant, recovery operator, and drafting. Franklin Medical Center has visitation by appointment only. You can schedule a visit by calling 614-445-5960 or by emailing DRC.VisitationFMC@odrc.state.oh.us. Visiting hours are determined by the Zone of the inmate. Franklin Medical Center also offers inmates video visitation through JPAY for a fee. You can video visit on Mondays, Thursdays, Fridays, Saturdays, and Sundays at 8:30am-10am, 11:30am-3:30pm and 5:30pm-8:30pm.